The location is fantastic, the host is very friendly and helpful, and it is quiet in spite of being in the very epicentre of the city. You also have the opportunity to park your car for free, although the yard tends to be quite full and sometimes you have to call people to move their vehicles in order to get out. Great location - shops and restaurant just round the corner. Checking out was very simple (pop in letterbox on way out). Apartment was very big and spacious. Host bought extra bedding and towels for us as we were a family of four. The location is the best to explore the old town and to get everywhere on foot. The flat is warm and comfortable in winter. The host was very nice and helpful (recommended us an exceptionally good restaurant around which is our favourite now) - thank you so much for everything, Stanislavas! We'll definitely be back. Excellent location with easy walking distance to everything in Old Town Vilnius. Apartment set up was nice. It had a bedroom plus a large fold out couch. All linens and kitchen items were provided. Easy checking in and out. Awesome host. Safe (and free!) private parking. Spacious comfortable and clean apartments in the heart of the city. This probably was our most wonderful stay in Vilnius so far out of many. + Excellent location! Close to old town restaurants, sights and everything. Beautiful old town. + Good size apartment for 2 kids and parents. + Free private parking but in weekends all parking slots may be reserved. The location is superb. The hosts are kind and responsive. The flat has all the essentials. We had great time in Vilnius and were quite satisfied with minor inconveniences below. Considering the benefits and disadvatages it's, of course, up to you to decide upon the value for money. Every experience is individual. Nice flat with a bedroom with a double bed and a large sofabed in the living room. Table and chairs for four in the kitchen. Big apartment in quiet area, in the heart of the historical centre. Great for both rest and explore the city by foot. All in all, the perfect place to stay! Lock in a great price for Apartments Latako Street – rated 9.1 by recent guests! Located in the Gothic-style house on the main street of the Old Town of Vilnius, Apartments Latako Street is close to Town Hall and Cathedral Square. It offers free WiFi and free parking in a quiet backyard. The spacious apartments all have a kitchen with dining area, a bathroom with hairdryer, cable TV, a CD player, and a washing machine. The Vokieciu shopping street, with many restaurants, bars and clubs, is only a short walk away from Apartments Latako Street. 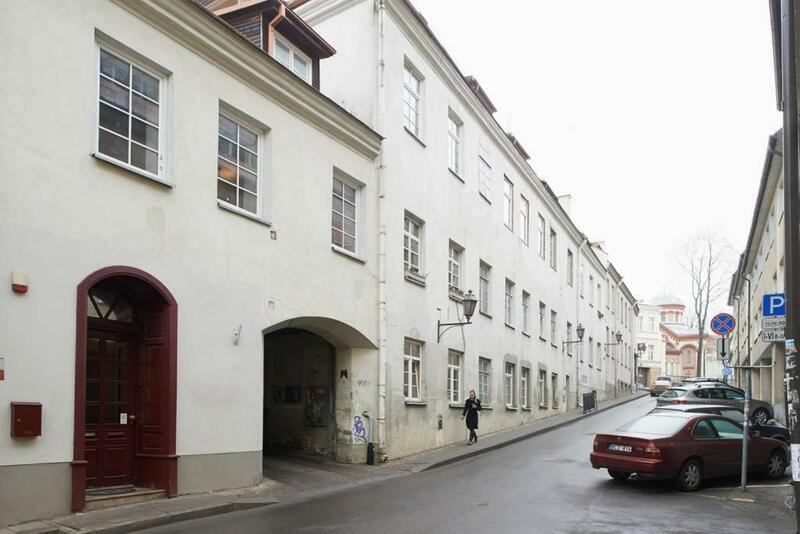 뀐 Located in the real heart of Vilnius, this property has an excellent location score of 9.7! When would you like to stay at Apartments Latako Street? This apartment comes with 2 single beds and 1 double bed. It is located at: Latako gatvė 1. This apartment comes with 1 double bed and 1 sofa bed. It is located at: Latako gatve 1. This duplex apartment offers 2 double beds and 1 sofa bed. This is what our guests think about us: “Great location, less than 5 minutes to the old town square. Quiet, peaceful and really big apartment with 2 levels and a decent kitchen (no pots though!) Lovely, sunny apartment and really helpful owners - definitely recommend!” Come and take a look yourself. Area Info – This neighborhood is a great choice for travelers interested in churches, architecture and history – Check location Excellent location – show map Guests loved walking around the neighborhood! House Rules Apartments Latako Street takes special requests – add in the next step! Apartments Latako Street accepts these cards and reserves the right to temporarily hold an amount prior to arrival. Please note that the apartments are located in different places in Vilnius. Guests are kindly requested to call the property shortly before arrival. The owner will then meet them near the apartments and hand over the keys. Contact details can be found in the booking confirmation. Please inform Apartments Latako Street of your expected arrival time in advance. You can use the Special Requests box when booking, or contact the property directly using the contact details in your confirmation. We had stayed at the same address before, in a different flat that was fantastic. This clearly influenced our initial reaction, when this apartment (No 11) did not match these expectations. No practical problems, just the interior design and colour of walls etc - a bit impersonal, compared to what we had hoped for. Waiting 20 minutes for the host to arrive. Apartment got quite hot and stuffy. Do not leave any windows open - lots of small flies came into the apartment and covered the ceiling/walls at night, woke up to find them all dead on the floor in the morning. Toilet and shower are in separate rooms but the toilet room is extremely small - not recommended for large people. Bathroom is small but sifficient. Furniture is outdated but that kind of suits the appartment. A bit dirty dishes, and problems with the hot water day 1, however it got better with the hot water later on. The bathtub didnt keep the water that was tapped into it. The loclization, the spacesious rooms, the manegers willingness to help. Enough space to sit comfortably and talk on the first floor and that the second floor had the beds. The beds are horrible, and a good sleep is essential. The owner put cheap IKEA- boxsprings - type Sultan - in there, but without a matress or even futon. This was like sleeping on a metal trampoline. Please do something about it. It drags down a great apartment. The place is a bit worn out. Shower only manual, not all the lights function, toilet downstairs seems on the verge of trouble. Could use a fix-up. Parked car tend to be boxed in on courtyard during day. Spacious. Ideal location. Wel equipped kitchen. - Keep your parking slot if you manage to get it. Parking slots used 90% - 110 % during our 3 days visit. - Toaster was broken, toilet was leaking (just a little bit), etc. Apartment was a little bit worn out but still clean. The equipment of the bathroom is a little worn out, but nothing critical.